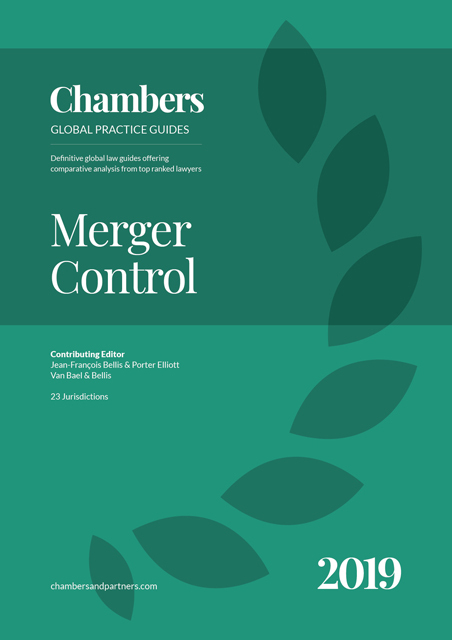 The Merger Control guide provides expert legal commentary on the key issues for businesses with competition matters. The guide covers the important developments in the most significant jurisdictions. Van Bael & Bellis is widely acknowledged as having one of the leading practices in EU competition law. Since the early 1970s, members of the firm have been involved in many of the seminal cases in the field. With one of the largest competition practices in Brussels, Van Bael & Bellis has extensive expertise in all aspects of EU competition law. Van Bael & Bellis has assisted clients in cases at both the EU and national levels, notably appearing before the European Commission and the EU courts, where the firm has acted as defence counsel in many landmark cases. Within the field of merger control specifically, Van Bael & Bellis has a dedicated team of merger control specialists and regularly represents merging parties in cases involving key issues of jurisdiction, procedure and substantive law. The firm has succeeded in obtaining clearance of numerous complex transactions before the European Commission. With its large number of lawyers qualified to practise in a number of EU Member States, the Van Bael & Bellis team also routinely helps clients to obtain merger clearance from Member State authorities for transactions which do not meet EU thresholds. The firm is also frequently called on to co-ordinate merger control filing efforts across the world. Picture yourself in the final negotiation session. The merger agreement has just been signed. It took months of difficult negotiations to reach this point. After countless late nights and weekends spent going back and forth on reps and warranties, pre-closing covenants and risk allocation, everyone involved could use a holiday. Yet before the ink on the agreement has had a chance to dry, reality sets in: the hard work is only getting started. With a deal now in place, the process of obtaining approval from the relevant competition authorities begins, and this will be no easy task. The parties are close competitors with significant shares in concentrated markets. There is a myriad of critical issues that require careful consideration and planning, and to ensure that approvals are obtained in a timely manner, the right decisions will need to be made. For starters, where does the deal need to be filed? This is a crucial question, as there are potentially serious consequences for failing to make a required merger control filing, including the imposition of heavy fines. Unfortunately, it can be tricky to determine where filings are required in a given case. Although an ever-increasing number of countries have some form of merger control law, there remains very little standardisation, with each merger control regime continuing to have its own test to determine which transactions amount to a notifiable event. Some jurisdictions catch only changes in control, while others also cover certain acquisitions of non-controlling minority stakes. Moreover, every jurisdiction has its own filing thresholds based on various factors such as the parties’ turnover, asset value, market share and the size of the transaction. Given this, determining where to file requires a careful country-by-country analysis. In the case of the present transaction, a filing requirement in the United States immediately comes to mind, as both of the parties are American. The European Union does as well, although it is not yet clear whether a filing to the European Commission would be required or whether the individual EU Member State authorities would have jurisdiction. (At least pre-Brexit there is no risk of having to file to both the European Commission and the UK Competition and Markets Authority, an advantage that will no longer exist once the UK leaves the EU.) Might a filing also be required in China, Japan or Korea? These are important merger control regimes and Asia is a key market for the target company. What about Canada? Both parties have plants there. What about Brazil and Mexico? Russia and Ukraine? Australia and New Zealand? Are there other jurisdictions that might not be on the parties’ radar but should be? Once it has been determined where merger filings need to be made, the next question is what the regulatory reviews will entail and what needs to be done in order to obtain approval in each jurisdiction. Again, each merger control regime has its own test for determining whether a given transaction will be approved, and while the approach may be broadly similar across jurisdictions, there are nuances in each that will be important to understand. For example, is the legal test for assessing mergers based on maintaining effective competition, avoiding dominance or some other standard? Are vertical mergers subject to the same level of scrutiny as horizontal mergers? How are efficiencies considered by the regulator in its assessment? Is the agency’s analysis based purely on competition law principles or are there other (e.g., public interest) considerations at play? What kinds of arguments are most likely to be persuasive to each authority, and how does one ensure a consistent approach across jurisdictions at a time when international cooperation between regulators is more common than ever? Of course, another key issue will be how the regulatory process affects timing. After all, there is no such thing as a deal that is not time-sensitive. In every transaction, there is a sense of urgency to close as soon as possible, ideally the day before yesterday. This urgency needs to be reconciled with the fact that, with some notable exceptions, most merger control jurisdictions require closing to be suspended until regulatory approval has been granted. Taking into account the time needed to prepare the filing(s) and the time it takes for the review process(es) to play out, closing can easily be delayed for a couple of months in simple cases to well over a year in more challenging ones. Reasonable timelines need to be set for the parties and expectations must be carefully managed. Once again, every jurisdiction has its own procedural rules and deadlines, so coordinating the reviews across the world can be a significant challenge. For the above reasons – and many more – navigating a global merger control filing and approval process is a complex business, and it is only getting more complex every year. This book aims to cut through some of that complexity by providing the reader with a practical guide that covers 23 of the world’s leading merger control jurisdictions in a user-friendly question and answer format. The questions in this guide cover the key rules relevant for a merger control filing assessment, including: what kind of transactions have to be notified, what are the filing thresholds, what is the procedure and timeline for notification and approval, what are the substantive considerations of the authorities and what kind of enforcement record do the authorities have? However, the questions also go beyond the letter of the law and probe for useful answers on how these rules are applied in practice. For instance, the questions on applicable fines for failure to file not only ask whether such penalties exist and what their legal maximum is, but, more importantly, whether these penalties are applied in practice and what penalties have been imposed recently. Although by no means a substitute for seeking advice from experienced merger control counsel, this book provides clear and practical answers to most of the fundamental questions faced by any company involved in a transaction that requires merger control filings. The reader will find this book to be a very useful tool for finding their way through the increasingly complex labyrinth of global merger control. As with any work of this nature, compiling this book has been a team effort. With this in mind, we would like to thank all the authors for their contributions, as well as the Chambers team for their diligence and professionalism.